Perma-Beads ® are specifically designed sinking beads to replace sand in any sand filter media system. There are no plumbing changes needed. 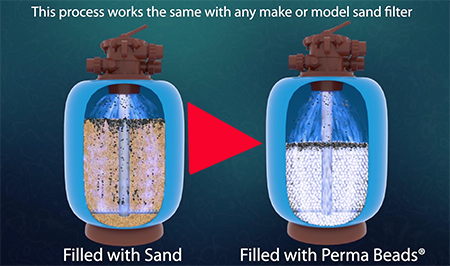 Perma-Beads ® eliminate clogging, compaction and channeling in any size, make or model sand filter. Advanced Aquaculture Systems offers free technical support to determine the proper volume of Perma-Beads ® to replace sand in any sand filter. We also offer free system design services for complete recirculating systems. We always take a very personal approach to our customer’s inquiries and provide free technical support and professional system design services.